Well, no one is going to win a design award for these clunky box-like speakers, but don't let that fool you into thinking they are no good. We really enjoyed having these around. For a start, they're powered speakers, which means there's an amp built into one of them and they work standalone with or without a stereo. They also work wirelessly if you have AirPort Express or Extreme running. You can beam tunes directly to the speakers from iTunes, although because there's no LCD display on the iStorm units, you'll need to return to the Mac to select new playlists. A remote also comes in the box, albeit a small and fiddly one with, again, no LCD. A key draw is the iPod cradle on the top of the main (amp) speaker. This powers the iPod when it's docked. There's no sync port, though, so you can't connect back to the Mac to update the iPod while docked. The sound is quite good, which surprised us. These speakers can really pump out the tunes when asked to and the sound doesn't distort much at high volumes. Musically, these are good all-round performers. Around the back of the left speaker is a 3.5mm line-in jack, a headphone jack and a proper RCA stereo for connecting a CD deck, for instance. There's a gimmicky bass boost button as well that we only turned on to test it worked. It does as you'd imagine it would. As desktop speakers to improve the sound from your Mac, these are perhaps a bit of an overkill. If all you want is basic fare, then you might be better off with something from the likes of Bose or Harmon Kardon, as the wireless ability and other inputs are not needed by everyone. But, if you have the space on your desk and don't mind the look of them, then you won't be disappointed. 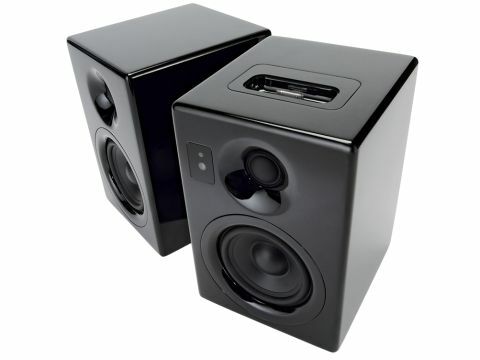 The price is on the high side for speakers, but you do get a good set for your money.